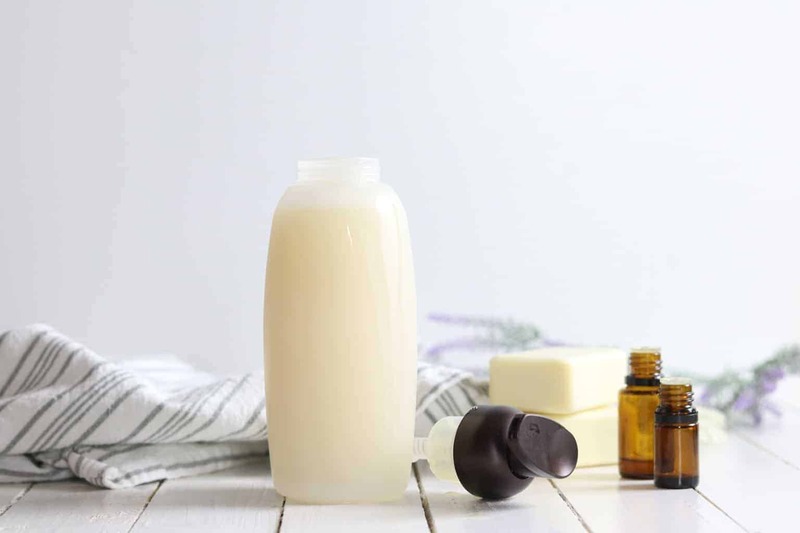 LEARN HOW TO MAKE ALL NATURAL SHAMPOO WITH THIS SIMPLE RECIPE AND VIDEO TUTORIAL. WITH SEVERAL ESSENTIAL OIL BLENDS TO MAKE THE SCENT YOU WANT! Ready to get toxins out of your home? Grab my FREE ebook with my favorite DIY all natural products. 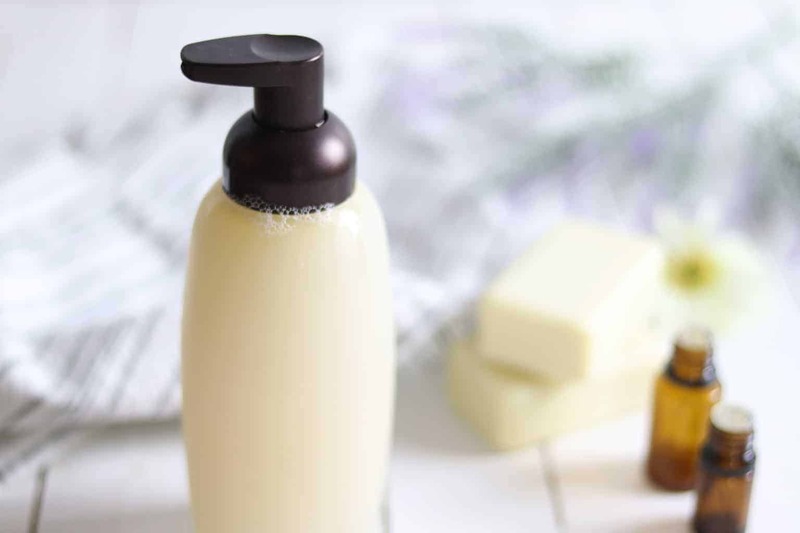 Making your own shampoo can be a very simple DIY project. You can customize the recipe to making it even more beneficial for your hair type. 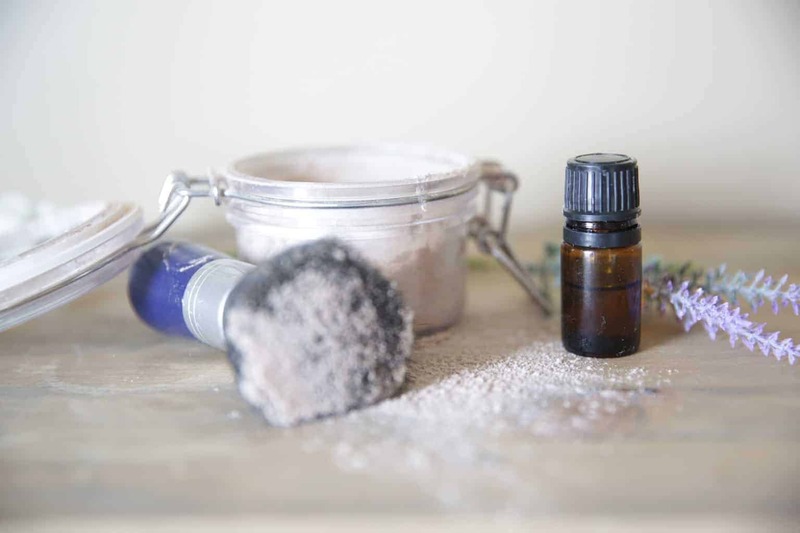 Essential oils can be added for scent and for added benefits. After trying a few natural shampoos I decided to make my own because it is a whole lot cheaper! If you aren’t a DIYer you can most definitely find natural recipes that work great, but not without a price tag. Once you start DIYing things within your home, you may get addicted, just saying. I am excited to share this all natural shampoo recipe with you! Mix all the ingredients together in a storage container. 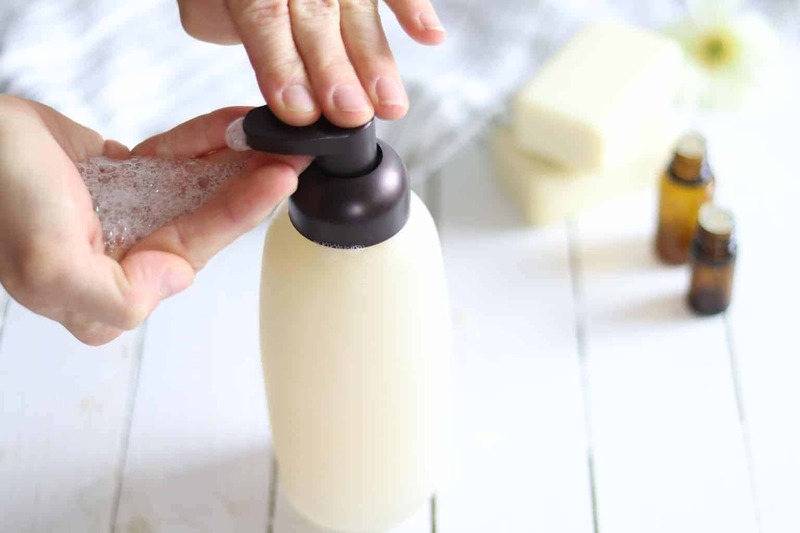 You can use an old shampoo bottle, foaming soap disperser, or a mason jar. After getting hair wet, apply a quarter size amount to the hair, and lather in. This shampoo is thinner than the typical shampoo, but it does lather up a ton! 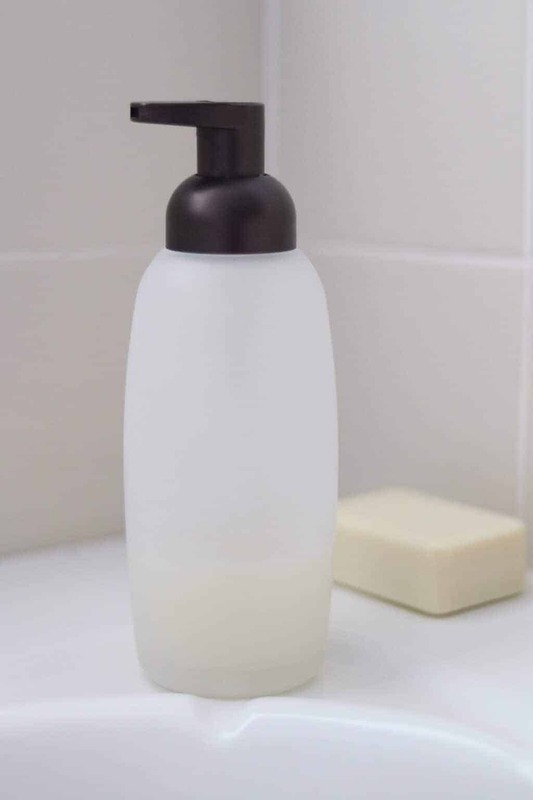 This shampoo will last for a month when stored in an air tight container. Get my baby shampoo and body wash recipe here. Traditional shampoos are made up of a lot of ingredients you will want to avoid. Ingredients that have been known to mimic estrogen, which will cause hormone imbalances. Ingredients that are known carcinogens, and ingredients that can cause severe allergic reactions. Castile soap is a very concentrated, vegetable based soap. It is typically made out of olive oil or coconut oil. It has natural antibacterial properties that can help kill infections on the skin and it is known to help with skin imperfections, like acne. Castile soap is a gentle soap that can be used on sensitive skin, and it is very good for the face. You can buy scented or unscented castile soap, I prefer unscented so I can scent it how I want with my essential oils. Jojoba oil is very moisturizing and can protect the scalp against dry flaky skin and dandruff. It is rich in vitamin and minerals like: vitamin A, the B vitamins, vitamin C, and zinc. All of which are amazing for the hair. If you have greasy hair you can leave this out of the recipe. Lavender– Studies have shown that lavender produces more hair follicles to help thicken and strengthen hair. Lavender has a beautiful floral smell that can promote calmness and reduce stress; stress can be the biggest reason for hair loss. Rosemary– Rosemary essential oil is the top oil for hair growth and thickness. It helps to treat dry hair as well as overly oily hair and can help prevent split ends. Melaleuca– Melaleuca promotes a healthy, clean looking scalp. It can be used to help with a dry itchy scalp and protect against lice. Cedarwood– This woodsy oil is great when you are making products for men because it has a very masculine smell. In fact, I use cedarwood in all the DIY products I make for my husband and he approves. It stimulates hair follicles and increases circulation to the scalp making it a top oil for hair loss. Peppermint– Peppermint oil is known for the cooling effect it has on the skin when used topically and for its refreshing minty scent. Peppermint is also great for the hair as it promotes hair growth and thickness. If you are used to a conventional shampoo you may not like this shampoo in the beginning. It takes some getting use to for you and your hair. When you first start using a natural shampoo you may notice your hair seems greasy or flat or fluffy or just not quite right. Here is the thing: Regular shampoos and over washing your hair can mess up the natural oil balance and pH levels in your scalp. Your scalp produces oils, this is a good thing. The oils help your hair to remain smooth, keeps your hair from drying out, and breaking off. When you wash your hair you remove these oils and your scalp produces more oils, so the more you wash the more oils your going to produce. The less you wash your hair and as your hair gets use to the new shampoo, your oil levels will balance out. Promise! I use to be one of those people that had to wash my hair daily and by the end of the day it was already looking greasy. Now I only wash my hair twice a week and it never gets greasy. It’s amazing! While you are “training” your hair dry shampoo can be your best friend! I shared a very simple DIY DRY SHAMPOO on the blog already, trust me you will need it. This stuff only requires two ingredients and it works. I’m so excited to try this!! Once you have adjusted is there just no need for conditioner then? My hair is really fine and straight so I don’t need conditioner but I think some hair types might. I am working on a conditioner recipe now! You’re welcome! It is so simple and works great! I’ve really been wanting to try natural shampoo. This seems like a great recipe to start with. Thanks! I love this! I just bought an organic and all natural shampoo brand, but am definitely going to try this when I run out. And yessss, I used to have to wash my have EVERY day and it would get greasy by the end of the day. But switched to about 2-3 times a week and was so surprised when it just adjusted! And its much healthier now <3 thanks for the awesome post and tutorial I can't wait to give it a try. You’re welcome! I wish I would of learned about this earlier, I love that I don’t have to wash it as often and it looks so much better! I am already using toxin free shampoo, but it is not working on my daughter. I am going to make this soon to try for both of us! Great recipe idea! Your favorite scent option sounds like it would smell so good! I’m curious about what the benefits of using coconut milk in place of water are? It just makes a different texture and more like conditioner. Coconut milk has a lot of benefits for the hair, but some people don’t like it and prefer water. Do you still use conditioner as well? I am working on a homemade conditioner recipe now and will be posting it soon! My hair is really fine and straight so conditioner isn’t a must for me, but because I have had so many request I am working on it now!